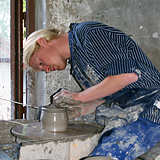 Raus Stoneware Factory, just south of Helsingborg is one of the last stoneware factories in Sweden and fully adhere to the original production of pots, jars and other household goods, which has been traditionally manufactured in our country. 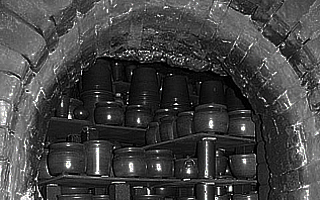 It is thrown by hand, burned 3 days with, about 8 tons of coal, in a coal-fired kiln and salt glazed in the same way as when Louis Johnson started production in 1911. Therefore it is no wonder that Raus ceramics have become popular as collectibles. Visitors come from all over the world to enjoy the old factory environment. 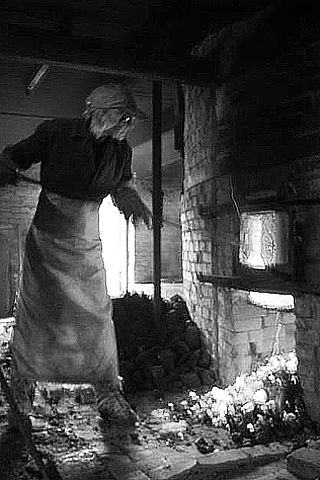 Today our coal-fired kiln is the oldest operating in Scandinavia. 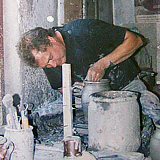 In 2003, Raus Stoneware Factory was taken over by family Nakajima, who opened Yoshio Nakajima Art Gallery & Museum. Yoshio Nakajima is a Japanese artist who came to Sweden in 1966 and began studying at the Valand School of Fine Arts in Gothenburg. Since then he has been faithful to Sweden. 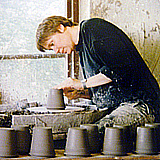 Nowadays he has his studio at Raus Stoneware Factory. Yoshio Nakajima is represented in a number of museums around Sweden, Europe, USA and Japan. 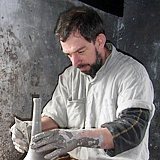 On 28 May 2011, Yoshio Nakajima opened the Museum and Art Gallery at Raus Stoneware Factory, in connection with his 70th anniversary, 45 years in Sweden and Raus Stoneware Factory’s 100th anniversary. 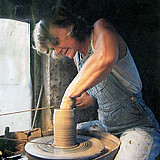 The manufacturing of pottery is handled, as before, by Lasse Andersson, Eva Isaksson and now also by the well known world champion Bente Hansen Brosböl and the Nordic potter champion, Bjarne Puggaard from Royal Copenhagen,. The store selection includes everything from traditional pots, jars, pitchers, mustard bowls and bottles, which has been always produced, to Advent candlesticks, ginger cookie jars, coffee mugs and unique modern sculptures. At Yoshio Nakajima Museum and Art Gallery, you can experience international art exhibitions and a permanent exhibition with art by Yoshio Nakajima. This is a place where anything can happen.